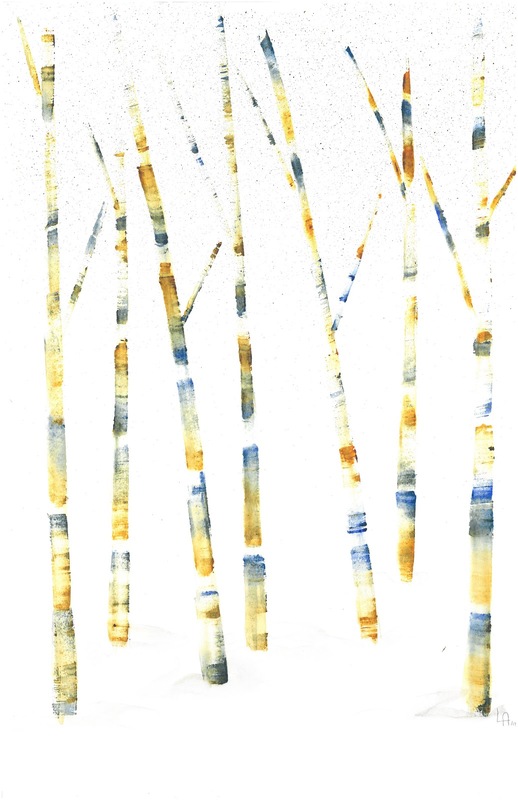 This is a painting I did for someone that ordered a larger version of the Winter Birch Trees I have in my shop. I really like this style of painting as it is less detailed than a proper botanical painting. It is nice to switch things up once in a while. This style allows more flexibility and the opportunity to experiment with colours. The way I paint these trees is by scraping an old credit card though a thick concentration of 3 colours of paint all at once. Then I "scrape" on the colour and once dry I soften things with a damp round brush. The scan doesn't capture all of the colour unfortunately as there are a lot of light grey and subtle yellow gold colours in this one. Wow, I never would have guessed in a million years that a credit card was used for the trees. I love learning 'behind the scenes' stuff like that.